But as is with any financial product, you should know all the details of the car loan, before you make a choice. Car loans are usually of 3-5 years but some lenders may offer loans for up to 7 years too. 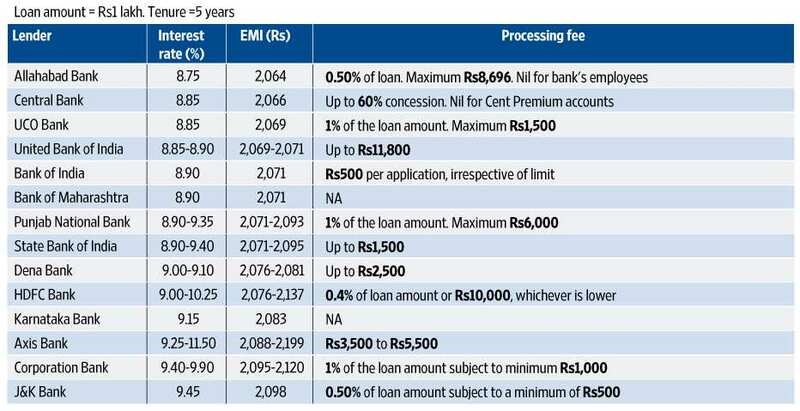 A loan for longer may mean smaller equated monthly instalments (EMIs), which makes the car seem more affordable, but overall, you pay more as interest. Don’t forget that a car is a depreciating asset, so taking a bigger loan may not be the best thing to do. But if you take a car loan for a short duration, the EMIs will be heavy and non-payment will mean a blot on your credit report. Try to strike a balance. Conditions apply to the loan amount also. For instance, some lenders give a loan for the full ex-showroom price of the car, while others may offer a loan up to 80%. In the latter case, you will have to pay the remaining amount yourself. But interest rate and tenure are not the only two factors to consider. Also, take a look at the processing fee and some other charges such as for prepayment or documentation. Look out for special or festival offers. Read more about these here. Do your homework and get rates from more than one lender. You can use this information to bargain further. Look for transparency in the terms and conditions of the loan so that there aren’t any issues later.